In addition to its beautiful beaches and natural habitats, Siesta Key also stands out for its unique residences. Amid the more than 100 condominium buildings spanning the 8-mile length of the island you will find a sprinkling of architectural jewels designed by Paul Rudolph, a pioneer of the Sarasota Modern style who is known for his cubist building designs and complex floor plans. A Harvard graduate who studied with Bauhaus founder Walter Gropius, Rudolph moved to Sarasota and partnered with Ralph Twitchell for four years before starting his own firm in 1951. 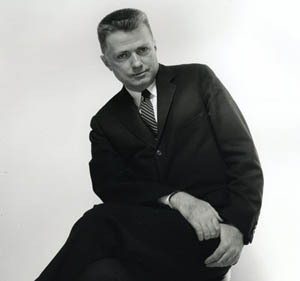 During the years 1948 and 1949, he toured Europe on a Wheelwright Traveling Fellowship and gained a reputation for designing modern, innovative vacation homes that used unique materials. He put this experience to use on Siesta Key. He designed more than 15 projects for the island, and more than 10 were built, according to The University of Massachusetts Dartmouth’s archives. Many of these were designed with Twitchell and built by Associated Builders, Twichell’s construction company, which allowed the team to tackle difficult building designs and the incorporation of new materials. Notable examples of Rudolph’s work still standing on Siesta Key today include the Lamolithic Houses, which were built in 1948 with Twitchell. These four identical speculative units have termite-, rot-, and hurricane-proof concrete walls that were poured using metal forms. Located near the public beach in the center of the island, each home was placed in a unique position to create a garden environment that is “zen like” according to one of the current owners. He also notes that while the footprints are small, the homes create the illusion of more space through an integrated indoor-outdoor blending of space. Indeed, one of Rudolph’s primary design achievements in the Sarasota area was balancing the natural environment from the inside out, which provided living spaces that were well ventilated and in harmony with Florida’s climate. For example, many of the homes were designed one-room wide to improve air circulation and they incorporate large overhangs to help keep the sun at bay. The David Cohen House, which is at the north end of Siesta Key on Big Pass, “is a re-interpretation of climate-sensitive, traditional southern architecture with its large openings, clear structural rhythm, and wraparound porch,” according to Joseph King, who released a book on Rudolph’s work in late 2009 called Paul Rudolph: The Florida Houses. The house was designed for local music patrons to accommodate their interests and in-house performances. Originally, Rudolph proposed an acclaimed two-story design, but the plan was downsized to a one-floor structure oriented along a north/south axis with east/west overhangs. The Revere Quality House, built in 1948 with Twitchell and also located at Big Pass, is another outstanding example of indoor/outdoor living design. Recently restored, this residence has a living room that opens with large glass sliding doors, which was considered innovative at the time, as well as a concrete roof on steel pipe columns. A third home by Rudolph/Twitchell on Big Pass, and one of their most innovative in Sarasota, is the Cocoon House/Healy Guest House, which was built in 1950. It was designed to catch the wind and take in the view with opening jalousie walls and a curved roof structure of steel straps and insulation board. Finally, Rudolph’s Siesta Key Hook Guest House (1952-1953) incorporated the first domestic use of the plywood vault. It also used a buttressed post-and-beam frame to raise the main living space above the landscape and accommodate the outward thrust produced by the plywood sandwich vaults. If you are interested in viewing Rudolph’s architectural designs on Siesta Key and in the city of Sarasota, stop by the Sarasota Convention & Visitors Bureau and purchase a copy of Tour Sarasota Architecture. This excellent guide provides an overview of buildings that commemorate the Sarasota School of Architecture and Sarasota Modern designs. This movement is a regional style of post-war architecture that evolved on the central west coast of Florida. It is characterized by a focus on building to suit the climate and terrain. Large overhangs, unique ventilation systems, large sliding glass doors, floating staircases, and walls of jalousie windows are incorporated into many of these buildings, which were constructed primarily between 1941 and 1966.